In our modern age, it is chic to believe that the Bible is a book of fables and allegories. But the fact is that many of the stories of the Bible are recorded in history. This article will prove that the Israelites of the Bible did exist and the Bible accounts about them are written in history. 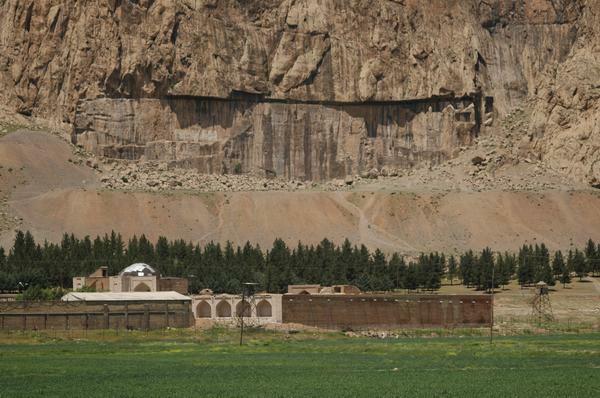 In 1847, Austin Layard drove his shovel into a mound at Kiyunjik and struck the walls of an Assyrian palace. He had found Sennacherib’s palace at the capital of Nineveh. Over 23,000 cuneiform clay tablets were found in two rooms. These were shipped to the British Museum for translation and study. The Assyrian cuniform tablets was translated by Professor Leroy Waterman at the University of Michigan. He wrote many articles based on his archaeological and linguistic research. He was a professor at the University of Michigan from 1915 to 1945. He also studied at Oxford University (1900-02), the University of Berlin in (1906-07), and the University of Chicago where he received his Ph.D. degree in 1912. The texts of the tablets reveal the Israelites, originally known to the Assyrians, as “Khumri” were placed in captivity near the river Habor, (Assyria) in Gozan River among the Medes in northern Iran. During the captivity the Israelites were renamed “Gimira” and “Cimmerians.” That was the way that the Assyrian pronounced Khimbri. Although they occupied the land of the Medes, they were a distinctly different people. PROOF THAT THE ISRAELITES EXISTED. The Israelites are found on a stone of Shalmaneser III excavated in 1861 at Kurkh on the Tigris, in southwestern Turkey. On the stone monument, Shalmaneser III records his victory at the Battle of Qarqar, near Hamath, on the Orontes River. The defeated armies included 2,000 chariots and 10,000 foot soldiers from Ahab, the king of the northern kingdom of Israel. This is the last record of the Assyrians referring to the” Israelites” by that name. The black stone, known as the “Black Obelisk,” depicts Shalmaneser’s victory over several kingdoms. The stone was found by Austin Layard and is housed at the British Museum. In the second row from the top is a carving of Jehu bowing to the ground, while his servants present gifts. In the text, Jehu is called the “Bit of Omri” meaning “house of Omri”. The Assyrians in this period of time used the term “House of Omri” to refer to the Northern Kingdom of Israel. Jehu was the son of Omri, an Israelite king. The Israelites would pronounced “Omri” which became “Khumri” in Assyrian. 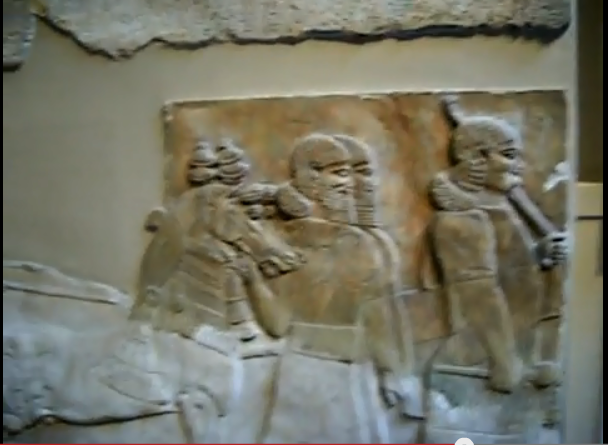 PROOF THAT ISRAELITES WERE TAKEN INTO CAPTIVITY BY THE ASSYRIANS. The Bible tells us the Northern Tribes were captived by the Assyrians and brought to Habor on the Gozan River in the land of the Medes. 2Ki_17:6 In the ninth year of Hoshea the king of Assyria took Samaria, and carried Israel away into Assyria, and placed them in Halah and in Habor by the river of Gozan, and in the cities of the Medes. 1Ch_5:26 And the God of Israel stirred up the spirit of Pul king of Assyria, and the spirit of Tilgathpilneser king of Assyria, and he carried them away, even the Reubenites, and the Gadites, and the half tribe of Manasseh, and brought them unto Halah, and Habor, and Hara, and to the river Gozan, unto this day. The Bible tells us the Assyrians captived the towns of Gilead, Ablebethmaachah, Janoah, Kadesh and Habor. 2Ki_10:33 From Jordan eastward, all the land of Gilead, the Gadites, and the Reubenites, and the Manassites, from Aroer, which is by the river Arnon, even Gilead and Bashan. 2Ki_15:29 In the days of Pekah king of Israel came Tiglathpileser king of Assyria, and took Ijon, and Abelbethmaachah, and Janoah, and Kedesh, and Hazor, and Gilead, and Galilee, all the land of Naphtali, and carried them captive to Assyria. Sargon II (722-705 B.C.) also makes mention of the “Khumri” in his record of the capture of Samaria. He refers to himself as the conqueror of “Bit-Khumri.” meaning “house of Khumri”. The Israelites lived the area called Gamir in Assyria according to Van, A.H. Sayce. He also interpreted the cuniforms in 1882. The people of Urartu attacked the land of Gamir. In around 707 B.C, a people known as “Gimira” lived among the Mannai. Their territory was only a few miles from the Medes, in the very areas where the Scriptures state the northern ten-tribes Kingdom of Israel had been placed. The obvious observation is that the Israelites living in the land of Assyria were used as a buffer region for Assyria. The nations would have to come through the land of Gamir to reach the rest of the inhabitants of Assyria. These Israelites fought for the King of Assyria. To summarize, after the reign of Sargon II (721-705 B.C.) that name Khumbi is never mentioned again. It is further noted that the Assyrian name “Gamira” is translated into “Cimmerian.” ( Prof. Leroy Waterman – Royal Correspondence of the Assyrian Empire – published by University of Michigan, 1930) The two words are pronounced the same!! The first historical record of the Cimmerians appears in Assyrian annals in the year 714 BC. These describe how a people termed the Gimirri helped the forces of Sargon II to defeat the kingdom of Urartu. Their original homeland, called Gamir or Uishdish, seems to have been located within the buffer state of Mannae. The later geographer Ptolemy placed the Cimmerian city of Gomara in this region. After their conquests of Colchis and Iberia in the First Millennium BC, the Cimmerians also came to be known as Gimirri in Georgian. The modern-day Georgian word for hero gmiri, is derived from the word Gimirri. This refers to the Cimmerians who settled in the area after the initial conquests. In 679 B.C. the Israelites or the Gemira as they were called, fled to the area around the Black Sea. The Greeks gave the same account but called the Cimmerians. The Assyrian Empire began to weaken this gave the Israelites a prime opportunity to flee the land of the Medes. The Israelites moved to the area around the Caucasius Mountains. They fought the Urratu.and drove them out and settled the area of Phrygia and Uratu. This is modern day Armenia. During the reign of Darius the Great a famous inscription was created called the Behistan Stone. It was built off an ancient road connecting the capitals of Babylonia and Media in western Iran. In 1847 Henry Rawlinson scaled the limestone cliff and copied the inscription off the Behistun Stone. The inscription is approximately 15 meters high by 25 meters wide and 100 meters high up the cliff face. It was significant because it contains the SAME INSCRIPTION written in three languages – Persian, Elam and Babylonian languages. On the inscription Darius mentions the empires he conquered. The Israelites are mentioned among the captured nations. The Persian word for Israelites was “Saka” but in the Babylonian language they are called “Gimiri”. As a result of the stone we now know that the people we called Gimiri were the same people as the Saka. The Saka in history was the people from Scythia! The inscription connects the people known in Old Persian as Saka, Sacae or Scythian with the people known in Babylonian as Gimirri or Cimmerian. Saka = Gimirri were the same people. The Behistan Stone proves that the Israelites were called Gimiri by the Babylonians and Saka by the Persians. We know that the Saka was the name for the Scythians who lived above the Black Sea. Elldad said that the Israelites left the land of Israel and were accompanied by a army of 220,000 soldiers. To be escorted by 220,000 soldiers, the escaping Israelites must have numbered well over a million people. The Black Sea region to which they are reputed to have escaped is almost straight north of the old kingdom of Israel. The ancient Greek historian, Herodotus (Bk 4), tells us that the Scythians travelled with their families and belongings in covered wagons. Note the similiarity to the early American pioneers in their covered wagons on the Western frontier. These mountains soared thousands of feet causing some historians to believe that they were impassable. But there was a path through this mountain range called ‘Daryal Pass’ sometimes called “the Pass of Israel”. Many Europeans throughout history used this mountain passage. The book of Esdras, one of the original 20 books of the Apocrypha, compiled in the Septuagint, the Greek Old Testament, in 250 BC. The book of Esdras describes the journey of the Israelites out of Palestine above the Black Sea. their own land. And they entered in at the narrow passage of the river Euphrates. For the Most High then showed them signs, and stayed the springs of the flood till they were passed over. For through the country there was a great journey, even of a year and a half, and the same region is called Arsareth (or Ararah). Then dwelt they there until the latter time, and when they come forth again, the Most High shall hold still the springs of the river again, that they may go through.” (2 Esdras 13, The Apocrypha). Also in the Fourth Book of Ezra (xiii. 39-45) it is declared that the Ten Tribes were carried by Hosea, king in the time of Shalmaneser, to the Euphrates, at the narrow passages of the river, whence they went on for a journey of a year and a half to a place called Arzareth. “Arzareth” is merely a contraction of “ere aeret,” the “other land” into which the Lord says He “will cast them [the people] as this day”. Josephus, a historian who lived during the first century, recorded that the ten tribes of Israelites lived across the border of the Euphrates River. He clearly identifies Parthia as the location for the lost ten tribes of Israel. At that time the Euphrates was the border between Parthian and the Roman Empire. The famous Mark Anthony was responsible for pushing the Parthians out of Palestine and establishing the Euphrates as the border between the Roman Empire and Parhia. It was the peoples of Parthia that lived beyond the Euphrates. They controlled that area of Asia Minor. The Messiah and the disciples were sent the Lost House of Israel. The proves that the Messiah and the Disciples knew exactly where the 12 tribes of Israel were located. They were not in Judea. For the most part, Judea was composed of the tribe of Judah and Benjamin only. There were many tombstones identifying the Israelites in Scythia. Aramaic was the language of the region of Halah and Habor, where Assyria settled many of the captive Israelites. Aramaic was used by the Assyrians as their language as well as the Babylonian and Persian Empire. For the period from 700–320 B.C., Aramaic held a position similar to that occupied by English today. TheTransactions of the Society of Biblical Archaeology in 1874 states that there tombstones found from a Hebrew graveyard in the Crimea. This is north of the Caucasus Mts. and above the Black Sea. “Chwolson and others of the Russian Archaeological Society found more than seven hundred Hebraic inscriptions in the area north of the Black Sea.